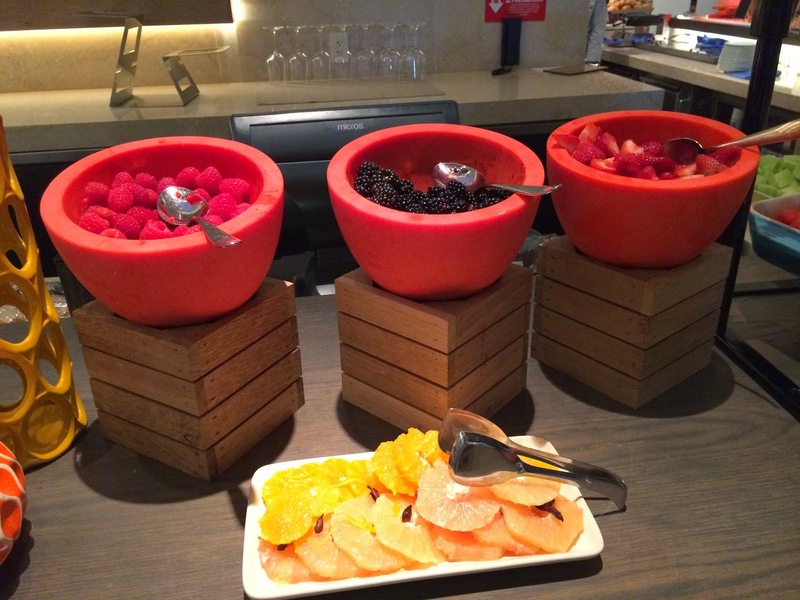 Welcome to Casa Dwyer: What Disney Benefits Do and Don't Convey at Four Seasons Orlando? 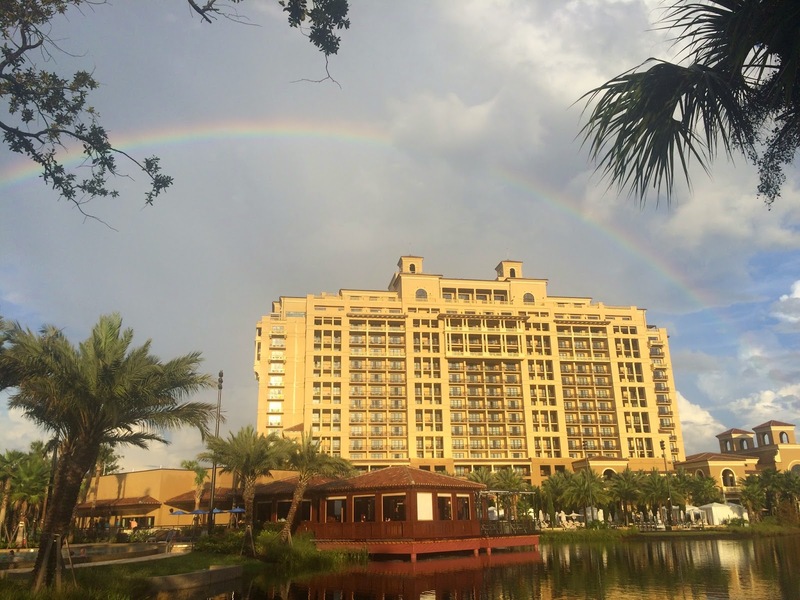 What Disney Benefits Do and Don't Convey at Four Seasons Orlando? Although Four Seasons Orlando is technically within Walt Disney World, the benefits of staying at a Walt Disney World Resort Hotel don't 100% convey. Understanding which benefits do and don't convey is important when deciding whether to stay at a Disney Resort or another property. The answer depends on what's important to you. Here's a list of benefits of staying at a Disney Resort. I thought it would be useful to discuss each of these in a little more detail. Disney provides ground transportation in the form of Disney's Magical Express which is a motor coach that goes from the Orlando airport to Disney World hotels. An additional benefit of this service is that they can collect your bags for you and deliver them to your hotel room. This can be nice if you come dressed for your day and you can head straight to the parks while you wait for your room to be available. Personally I find this approach to be a potential point of anxiety. Leaving the airport without your luggage and hoping it's collected and delivered your hotel is a bit disconcerting. And checking bags in the first place is increasingly a source of additional cost. I prefer to pack light, carry all of our bags on the plane, and take matters into our own hands. To get to Four Seasons Orlando from MCO you can pay for a bus, rent a car, take a taxi, or arrange for a town car. We went with a town car in part due to the unavoidable valet-only daily parking fee (I think it was $24). I emailed the resort and they made the arrangements. We met our driver at baggage claim (he had an iPad with our name on it) and he took us and our bags directly to the hotel. Our flight got in at noon, and we were at the pool by 1:00 pm thanks to an early check-in. Total cost: $155 plus gratuity. We requested and received an early check-in at the Four Seasons thanks in part to booking our reservation through a Four Seasons Preferred Partner travel agency. Both forms of transportation (the Disney Magical Express and the towncar we went with) are operated by Mears. On one hand you get right into the Disney experience with the Magical Express. On the other you get a more efficient, private experience with the town car. Advantage Disney, but I really prefer the town car approach. One of 2 Four Seasons motor coaches. Always right on time. Never crowded. To get between their parks and hotels, Disney offers a combination of busses, boats, and monorails. No single resort is near all of the parks though, so it's key to select a resort based on location, you'll likely find yourself using a variety of Disney resort transportation options. Even if you're not staying at a Disney Resort Hotel you can still take advantage of the Disney transportation options. For example to get between Magic Kingdom and EPCOT you can take a monorail. Or to get between any two theme parks you can take a bus. They key difference in transportation options between various hotels is getting to and from your first/last park of the day. 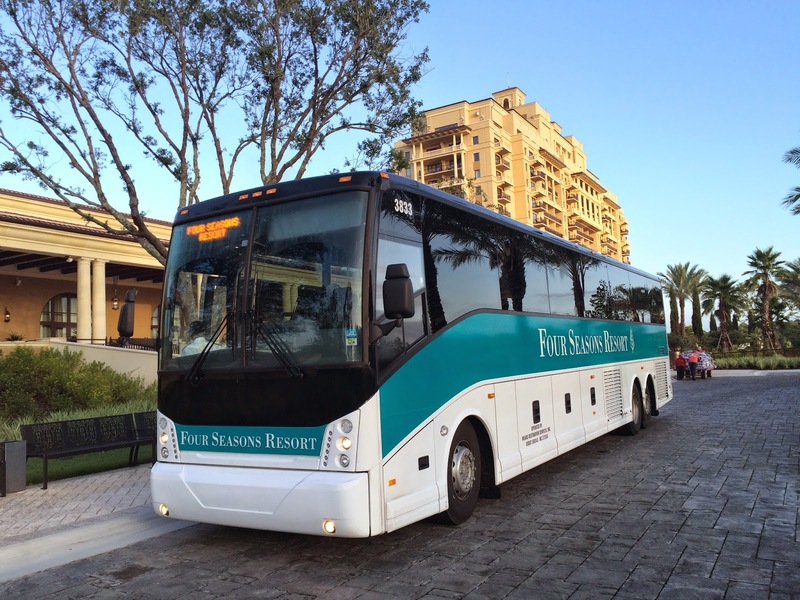 October 2014 Four Seasons Orlando bus schedule. Pro tip: Snap a picture of it with your smartphone upon arrival. Four Seasons offers their own private motor coaches that travel on two circuits. One goes between the Four Seasons, Magic Kingdom, EPCOT, Hollywood Studios, then back to the Four Seasons. The other goes between the Four Seasons, Magic Kingdom, and Animal Kingdom. I appreciated that the Four Seasons bus runs on a schedule (whereas it's not always clear when the next Disney bus comes in my experience). So although the Four Seasons bus not come as frequently as the Disney busses, if you plan ahead a bit you can catch it without much standing around. Advantage Disney (depending on which hotel you stay at) but the Four Seasons motor coach is uncrowded and runs on a reliable schedule. 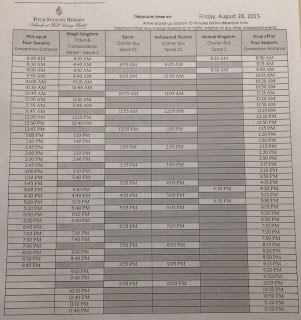 Each day one of the Disney parks opens early or stays late for Disney Resort guests. This benefit is not available to Four Seasons Hotel guests. It's a bit surprising actually since this benefit does convey to Dolphin/Swan guests (a Starwood property also within Disney World) and even to the Hilton Orlando by Downtown Disney. For park warrior types that hit each park early to avoid long lines at marquee attractions this may be a deal breaker. But for those visiting just a few parks during a visit, or if you're not into hitting parks right when they open this may not be that big a deal. Keep in mind that on days when the Magic Kingdom opens early, the entire park doesn't open early. 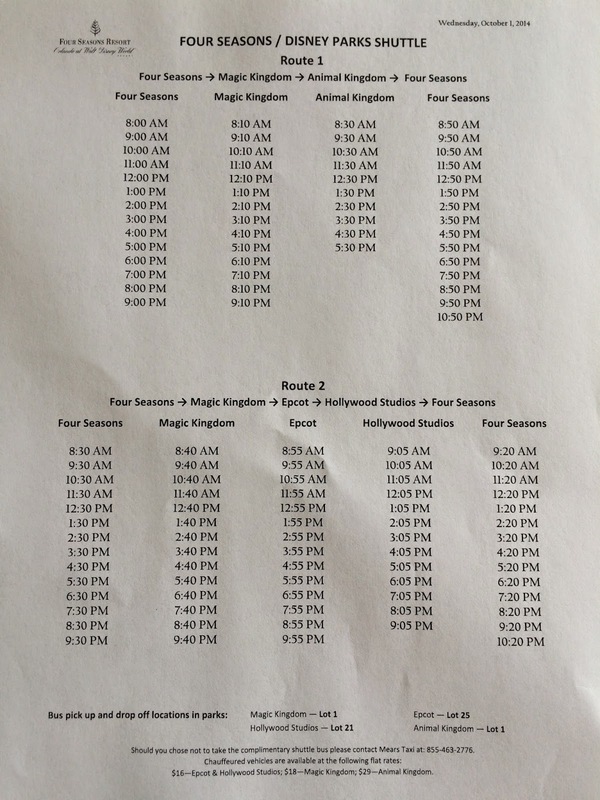 For example last year when we had Extra Magic Hours (since we stayed at the Swan) we wanted to hit Pirates, Jungle Cruise, Splash Mountain and Big Thunder Mountain yet Adventureland and Frontierland didn't open until the regular park opening time. And on nights when EPCOT stays open late you can easily stay late even if you're not staying at a Disney Resort hotel - you just can't go on any rides. Since you'll probably be there to eat and watch fireworks this may not be a problem. MagicBands are a newish invention whereby rather than having a plastic card with a magnetic strip and RF ID that stores your park tickets and FastPass+ reservations you wear the equivalent on your wrist. I don't mind using my card. Draw. FastPass is a handy invention whereby you can make a "reservation" to go on a popular ride within a 1 hour time slot. It used to be that you had to visit the attraction and get a paper ticket to come back later. With FastPass+ you can make reservations without going to the attraction using your smartphone. Or you can even book FastPass+ reservations before you arrive at the park. Months in advance in fact. Disney Hotel guests can make FastPass+ reservations 60 days out, Four Seasons guests can book them 30 days out. I was bummed when I discovered this but quickly realized I wasn't enjoying planning our trips so much so far in advance. Dining reservations are one thing but deciding which days to visit which parks ahead of time (what if it rains? what if we're tired?) let alone which time to go on which rides was too much for me. Advantage Disney for planners. Otherwise no big deal. I'm not a fan of Disney's dining plans. I prefer to just pay for what we eat. We don't always spend the entire day at the parks, and sometimes we get by with just snacking (for example at the Magic Kingdom where compelling food options are scarce). That said I know some people who get a lot of value out of the Disney Dining Plans so if they work well for you and it's part of an enjoyable vacation experience where you pay for your meals and snacks up front it's definitely something to be aware of because the ability to purchase a Disney Dining Plan is contingent on staying at a Disney Resort Hotel. 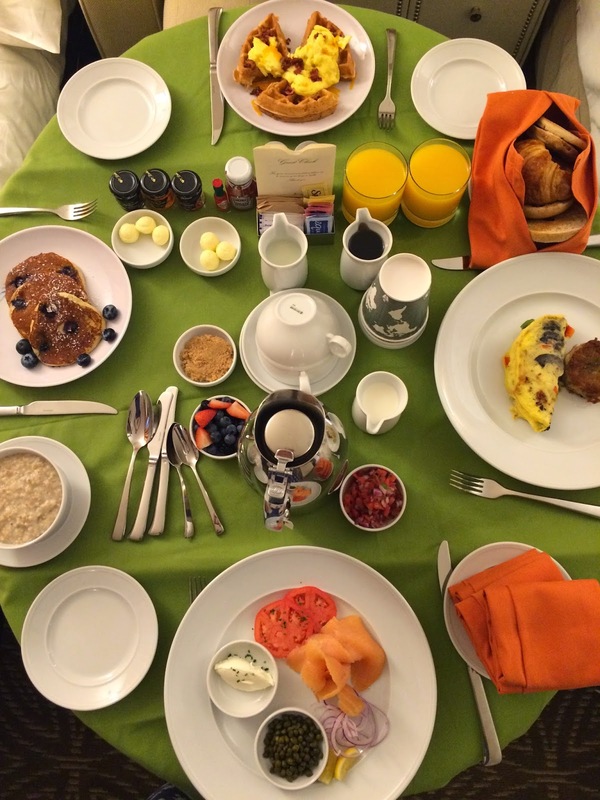 Our stay at the Four Seasons included room service breakfast each day for two adults. A bountiful, beautifully presented affair delivered to our room each morning right on time. Our kids would typically order pancakes or waffles for $6 plus tax and delivery charge which we'd supplement with bits of our feasts. Worked out great. Nice way to start the day. I know I wouldn't typically spend $100 a day on breakfast but this does help soften the blow of the Four Seasons room rate. We also received a $100 food & beverage credit to be used throughout our stay thanks to the Preferred Partner booking. Depending on the Disney Resort Hotel you're staying at, they may offer outdoor movies, pools with slides and such. They might also consider character breakfasts a piece of resort entertainment. Character breakfasts are available at a number of Disney resorts and even within the parks. They're not typically exclusive to guests of that hotel nor to Disney Resort Hotel guests at all. We visited the one at the Grand Floridian a few years back while staying off-property. It was okay. A bit hectic as you'd imagine with a heavy carb/calorie laden buffet. Four Seasons offers a character breakfast at their Ravello restaurant with Goofy, Mickey, and Minnie. 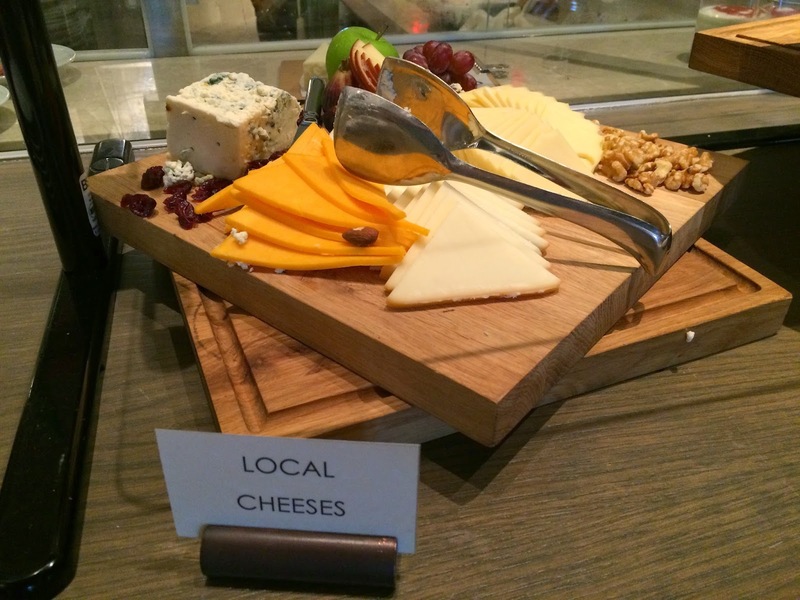 The food selections are terrific with fresh berries, local fruits, cheeses, and honey. Eggs/omelettes made to order and charcuterie. It's terrific. But really when it comes to resort entertainment I've never seen anything like Four Seasons Orlando. A lazy river, splash pad, a teen hangout, rock climbing wall, waterslides, you name it. What was so impressive about it was that there's something for every age group. And it never feels crowded. 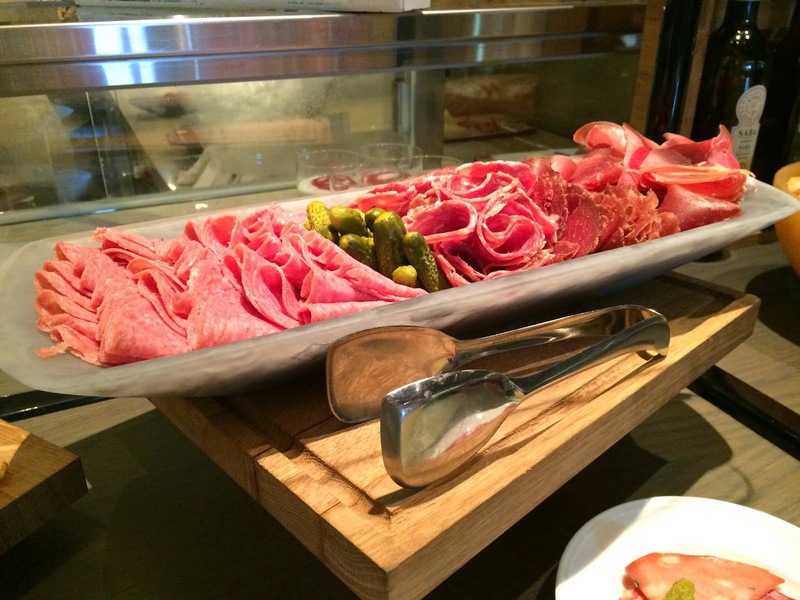 The service at Disney Hotels varies, but the service at the Four Seasons is unparalleled. They're never stuffy or pretentious. They just intuitively know how to give each guest what they're looking for. Say you want to visit the pool. At some resorts you need to present your room key to get a towel or two. And if you're lucky they'll bring you reliable food & beverage service after that. At the Four Seasons as soon as a guest enters the pool area you're greeted by an attendant that sets you and your family up with towels over your chaise lounge or cabana, extra towels for drying off, ice water, and a menu. Then they come back and check on you in a non-annoying way at regular intervals. Another example: On the morning we were checking out of the Four Seasons there were 3 other people checking out at the same time. And a couple of spouses standing behind them. I was behind the spouses for about 15 seconds and yet another desk clerk appears out of nowhere and apologizes for the long wait. Contrast this with queues to check-in at some Disney properties. Have you ever seen the lobby at the Grand Californian? It's a beautiful craftsman inspired lodge where people practice the art of waiting in line. This isn't necessarily a Disney Resort Hotel benefit so to speak but some Disney Hotels do offer kids clubs and it is a big differentiator if you have young kids. All hotels say they can arrange for private babysitting. But I don't know anyone who has actually taken advantage of that. However, I know a lot of people who enjoy a kids club if it's presented in a way that's easy to take advantage of. 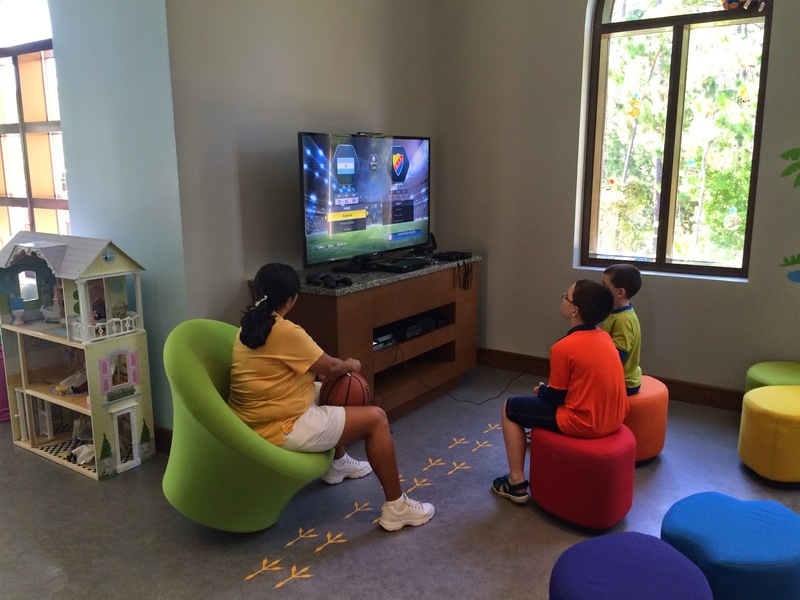 Some Disney hotels have kids clubs. 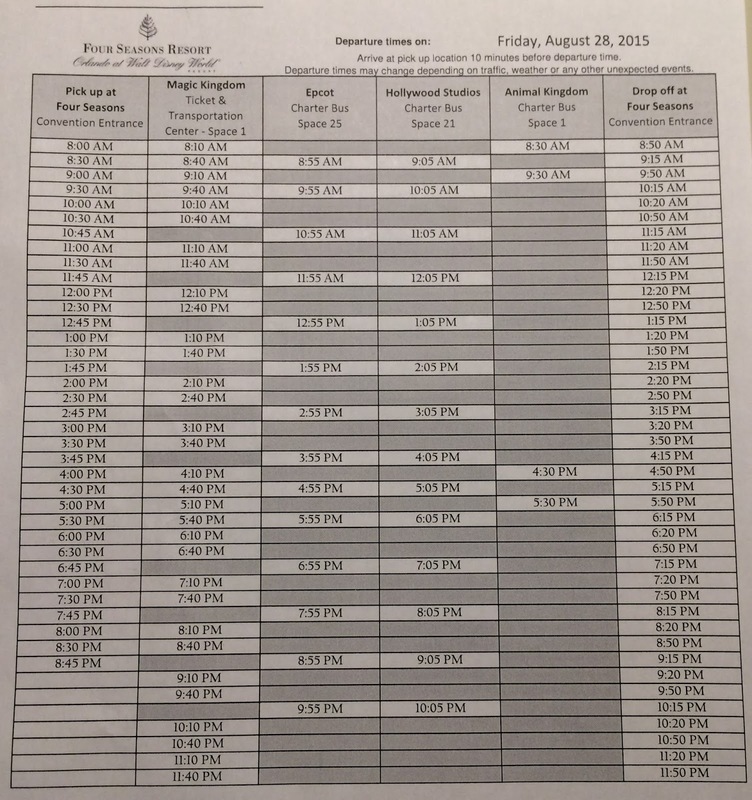 And Camp Dolphin (at the Starwood Swan & Dolphin) offers 2 hours free if you dine at one of their hotel restaurants. That's a decent option and you don't even have to be staying at the hotel. Counselors even know which team Messi plays for! But the Kids for All Seasons program takes it to another level. Open from 9-5 each day you can drop your kids ages 4-12 off for complimentary supervised play. With the lazy river, waterslides, and pools it took our guys a couple days to be interested in KFAS but when the saw they had all the latest gaming systems there it provided a nice afternoon relief to the blazing hot sun. And an opportunity for us to visit the adults-only pool area. The Four Seasons Orlando isn't for everyone. But if you're planning a trip to Disney World and you're considering some of the pricier Disney Resorts I'd highly recommend checking whether the Four Seasons might be a better option for you. In conjunction with no-expiration park tickets and every other day park visits we returned from our Disney World vacation more rejuvenated than prior Disney Parks visits. It felt, finally, like a vacation. Drop me an email or ping me on Twitter (@RobertDwyer) with questions or comments.